The auto maker&#8217;s overall sales rose 5.6% in October to 186,759 units from 183,395 in like-2010, according to WardsAuto data. The result adjusts for one fewer selling day in the month compared with year-ago. General Motors’ sales chief thinks the auto maker still can hit its target of 10,000 Chevrolet Volt deliveries this year, although the extended-range electric vehicle must turn in 5,000 sales over the next two months. GM’s overall sales rose 5.6% in October to 186,895 units from 183,759 in like-2010, according to WardsAuto data. The result adjusts for one fewer selling day in the month compared with year-ago. The auto maker sold 1,108 Volts in October, marking the best month for the EREV since its launch late last year. To date, the car has accounted for 5,003 deliveries. At the Volt’s launch last year, GM executives forecast 10,000 sales this year. Deliveries in 2012 should hit 60,000 of the Volt and export-twin Opel Ampera, combined, they say. 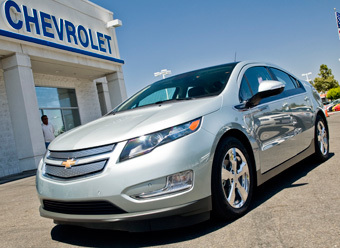 Johnson blames the Volt’s slow sales pace on limited availability. GM has ramped up output slowly to make sure dealers know how to sell the one-of-a-kind vehicle, he says. It also required them keep at least one demonstration model on their lots. Through the year’s first seven months, only select dealers in a few states could get a Volt, but Johnson says the distribution channel has grown to 2,200 dealers and will be at 2,600 by January. The Nissan Leaf EV, which launched alongside the Volt, sold 849 units in October, and its year-to-date deliveries stand at 8,048. GM has staked a great deal of money and reputation on the Volt, hoping the car will serve as a cornerstone in its bounce-back from a 2009 bankruptcy. Cristi Landy, director of small-car marketing at Chevrolet, tells WardsAuto the car has only just begun its national launch, despite being on the market for 11 months. Over that period, the auto maker conducted a model-year changeover, which further contributed to its slow launch. “We haven’t marketed (the Volt) much because we haven’t had any vehicles,” she said on the sidelines of a recent Detroit-area event. Television advertising for the Volt began late last month, with GM airing the first two of five commercials aimed at teaching consumers more about the EREV. Landy says there has been much confusion about how it works. Unlike the all-electric Leaf, which travels some 90 miles (145 km) before it needs recharging, the Volt goes between 25 and 50 miles (40-80 km) on electricity before a range-extending internal-combustion engine sends it another 300 miles (483 km) before the driver must fill-up with gasoline or recharge. Landy compares consumer knowledge of the Volt to the Toyota Prius hybrid, which started slowly a decade ago to become one of the best-selling cars in the U.S. So far, Volt sales have been strongest in urban areas and among wealthier buyers, she says. However, price is not the biggest reason for a missed sale, rather it’s overwhelmingly an availability issue. The 4-passenger Volt starts at $39,995. Deliveries of the new Chevy Cruze compact car, another cornerstone of GM’s restructured business, slowed in October to 14,295 units. It marked the second straight month sales were short of 20,000. Johnson points to seasonality, because small-car sales tend to weaken late in the year. The Chevy Sonic, another new small car from GM, posted sales of 3,833 in October. Dealers continue to receive the first models, and Johnson says early deliveries of the B-segment car have been transacted at $17,000 per unit. That’s about $1,000 better than its key competitors and $1,500 above the average transaction price of its predecessor, the Korean-built Aveo. Johnson expects the U.S. economy to continue its slow growth, gradually releasing pent-up demand from four years of below-trend annual sales. “That’s what’s been happening so far this year, and we expect it to continue into next year,” he says.